In our third video, we wanted to see how well the Samsung Droid Charge would stacked-up next to the HTC ThunderBolt when running some benchmark applications. The first benchmark app ran was Quadrant, and we noticed that it was running a bit faster on the HTC ThunderBolt and also finished a few seconds earlier with a score of 1811. Meanwhile, the Samsung Droid Charge got a surprisingly low score of 1037, which is even less than the Motorola DROID X. We're not sure why the Quadrant score is so low on the Droid Charge, but we have ran the test several times and the highest score we've got is 1050. We also ran the AnTuTu System Benchmark program, which tests 8 areas of performance, and got a score of 1886 on the Droid Charge, but again the ThunderBolt did better with a score of 1991. Lastly, we ran the NeoCore graphics benchmark app, and got 56.8fps on the Droid Charge and 59.2fps on the ThunderBolt. Despite the HTC ThunderBolt achieving better benchmark score all around, we found that the actual use of the Samsung Droid Charge was quick, and we didn't notice any lag on either of the two devices when moving between the 7 home screens, opening the app menu, or loading apps. Remove the space, don't know why that happened. Not shocked, should be dual core. Waiting for Bionic, well worth it. IMO. Dual core processors are the wave of the future, the charge isn't even an upgrade over the Thunderbolt which is cheaper. The original Bionic is being cancelled, but they're applying the name to the next top flight Droid from Motorola. Which is expected to come out in the summer at some point, maybe fall. Shame VZW did away with annual upgrades cause that would fall perfectly for me since I got my X at launch. the annual upgrade were only discontinued for people who activated or upgraded on or after jan 16 2011. Everyone who did before was re-enrolled in the program for 1 more annual upgrade and new every two credit. This means that you will be able to upgrade at the 1 yr. point provided you keep your acct. in good standing, unlike the mofos over at sprint who didn't grandfather in their customers into their annual upgrade program for Premier customers, they all have to wait until 22 months to upgrade, no matter when their last upgrade was. Not surprised considered the galaxy s phones all got crappy scores despite that they are just if not more powerful. Seems that those benchmarks can't read samsungs hummerbird processor like they should. Yea as sniggly said I got a nice 1960 benchmark score and a nice speed increase with the DROID x. The DROID x 2 is the phone to get. Or wait for the bionic which I am probably going to do. 1960...VERY nice. Glad the update is working for you. :) I'm personally drooling in anticipation for the BIONIC, whatever model it actually ends up being. It's because of the memory system that samsung employs in their android phones, it kills it I/O scores in quadrant. Once you fix it to a ext4 memory system it gets more realistic. My Captivate gives me a 1510 and thats with the newest quadrant that adjusts the I/O method for the ext4 fix. XDA is your friend. Surprised PhoneArena didn't mention that as an ongoing Samsung issue. The most important bit of all: "we found that the actual use of the Samsung Droid Charge was quick, and we didn't notice any lag on either of the two devices when moving between the 7 home screens, opening the app menu, or loading apps." Benchmark scores really don't mean anything. All you need to ask yourself is: does your phone lag? Yes? Well, try a different ROM. No? OK then, you're fine. sad to see this thing turned into a royal pos. But not at all surprising. It's a Samsung, which means the firmware is a hodgepodge of bits from other phones, and the global drivers are veal. Just look at my omnia II if you doubt it. It is important to note that the Samsung 'droids' are all v synced. Hence the cap rate for the fps. It looks as though the benchmark might be trying to do something that the Charge itself isn't so great at, since "we found that the actual use of the Samsung Droid Charge was quick, and we didn't notice any lag on either of the two devices when moving between the 7 home screens, opening the app menu, or loading apps." It's possible that the Charge could have some functionality that the benchmark just can't take advantage of. From what I have seen as a newbie in the tech world is that these benchmarks speak to the quality of a product, maybe not so much the function. As it consistantly comes in behind the T-bolt, it still is a quick device, and the average user won't be dissapointed. But it seems as though the little things that make some devices a little quicker, a little more responsive, are also the little things that make a device last longer, respond better to upgrades, and provide a better experience over the life of the device. Samsung doesn't put out bad stuff, and I am sure the Charge isn't junk. They just seem a little behind in quality compared to a lot of other manufacturers. All Samsung phones are capped at 56 fps by default. It can easily hit 75 fps uncapped and not even overclocked. 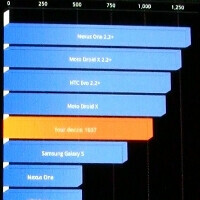 I just did a benchmark test on my droid charge yesterday using antutu benchmark. I got a score of 2930... non- jailbroken, using GO Launcher. i dont know if that would make a difference but Charge out-performed all of the test between it and my friends evo 4 3d.